Okay, I know some people out there aren’t going to believe me, but sometimes educational things can be fun. Sometimes fun things can be educational. Our parents and teachers weren’t totally misguided. Exhibit A: logic puzzles. Are they the greatest puzzles out there? It depends on your tastes, but at the very least I expect most fans of video games to enjoy logic puzzles in some form or another. The interesting thing is that no matter how they are presented, they all come down to a set of very basic rules that can be diagrammed in a way that looks more like homework than entertainment. Throw in an element of time pressure and you’ve got yourself a blueprint for a fine video game. 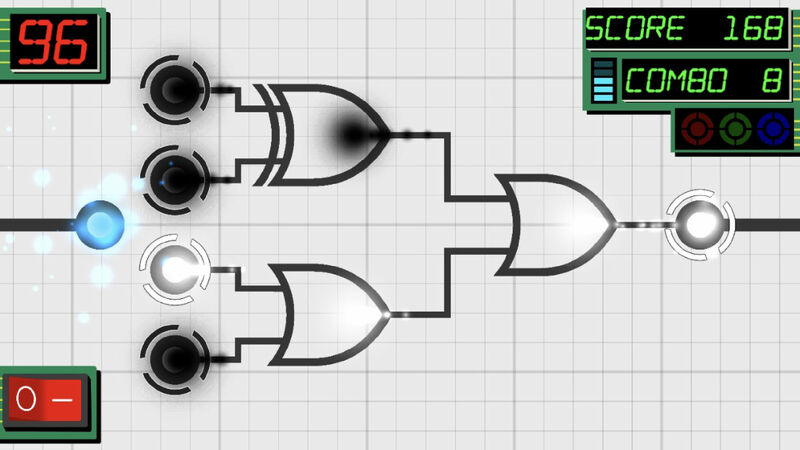 Schemata (Free) is not the first game to take logic diagrams of digital circuits and turn them into a toy, but it does a pretty fine job of the idea. Its goal seems to be to teach the player some basic information about logic gates while presenting them with a fun puzzle game experience. You need to activate or deactivate nodes to light up the next node and move forward. There are six different types of gates in play here: AND, OR, XOR, NAND, NOR, and NXOR. They’re all represented by their proper symbols, and if you don’t know how they work the game does offer a tutorial to explain them. For example, if you’ve got an AND gate in front of you, you’ll need to activate both nodes to light the next one. It’s simple enough on its own, especially since the game will show the next node lit once you have it right. It’s not quite as easy as just messing around with lights until the next one lights up, however. Even on the easiest difficulty setting, you’ll have to contend with a timer that constantly ticks down as you play. Every so often you’ll have a chance to restore some of that time, but you will eventually run out unless you’ve very quick. How often you’ll hit those precious restores largely comes down to luck. The path splits at various points, and while you can sometimes see a time restore on the edge of one of the paths, that only helps you if it’s the very next point on the diagram. 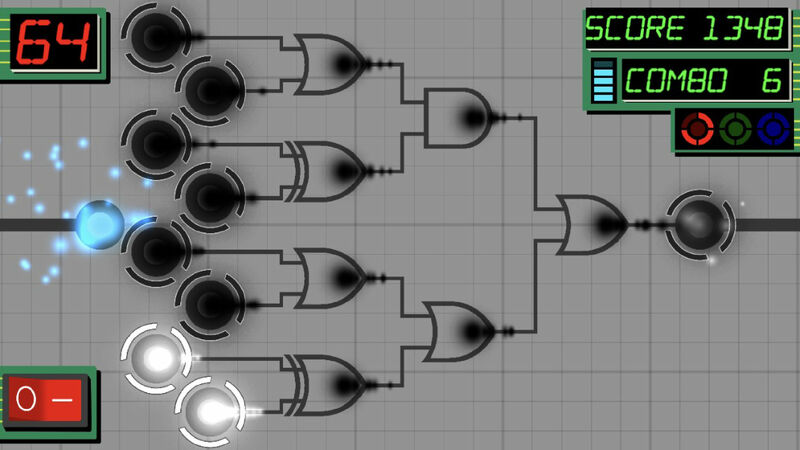 If that timer isn’t enough, the circuits themselves also begin to get more complicated as you play. While the game starts off with one gate per screen, you’ll soon be dealing with far more complicated multi-gate diagrams that require you to think one or two steps ahead. Not such a big problem if you didn’t have to do it quickly, but it can be tricky to untangle things sometimes without missing a beat. Of course, if you have all of these symbols memorized, you’ll probably be able to glide through with less wasted time. If you don’t have them all sorted in your head, you likely will after playing Schemata for a while. On the easiest setting, you’ll only have to deal with a few different gate types. Do well enough on that setting and you’ll unlock the next difficulty level, which uses all of the gates. Get a good score here and the next level will unlock, which makes it so that activating or deactivating a node eats up some of your timer. This makes it harder to bluff your way through by just flicking the switches until the node lights up. But wait, there’s still more. Do well on that difficulty and you’ll unlock the last setting, where you not only have to contend with all the different gate types and the activation costs, but can also no longer see if the node is activated until you actually tap on it. The faster you work, the higher your score will be. You can also rack up points by making combos, which requires you to get through each gate relatively quickly. The game keeps track of your scores in each mode, and the scoring system is flexible enough that you can get quite a bit of fun out of simply trying to top your previous best. Your scores for each mode are tracked on Game Center leaderboards, and there is even a list of achievements to work through. The graphics are fairly simple, but the game does have a few neat effects like scorch marks and the gradual loss of light that sets in as your timer winds down. The music is unobtrusive and aims for that sort of 1980s “inside the computer" synth that used to be all the rage. In addition to the four basic difficulty settings, there are also two infinite modes based on the two highest difficulty settings. 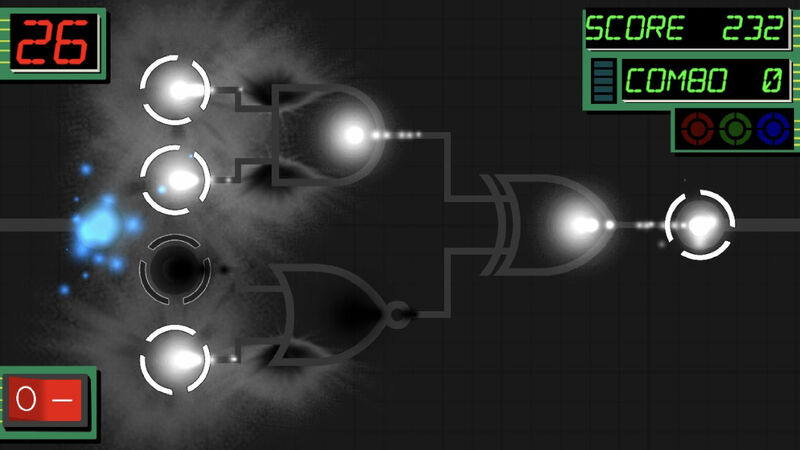 Ordinarily, your game will end when you complete three circuits. These unlockable infinite modes let you go on until you run out of time. Rounding things out is a casual mode where you can play without a timer, and a sandbox mode that lets you mess around with all the different types of gates. I really appreciate that the different difficulty settings actually have their own parameters as opposed to just speeding up or slowing down the timer. It makes each mode feel valuable to the overall selection and nicely reinforces your increasing familiarity with the logic gate symbols and what they mean. Schemata is a fun little puzzle game that also serves as a very basic primer for something players may or may not already know about. Ultimately, that’s all just window dressing for an enjoyable, tense puzzler that requires quick reflexes and even quicker thinking. But hey, at least if someone catches you playing it, you can say you’re studying circuit designs or something. The game is free to play with ad support, or you can pay a $1.99 IAP to permanently remove them. While it’s more of a riff on something you’ve probably seen before rather than being something totally new, it’s well-made and definitely worth checking out.